Do you want to motorize your Three Roller Mill? 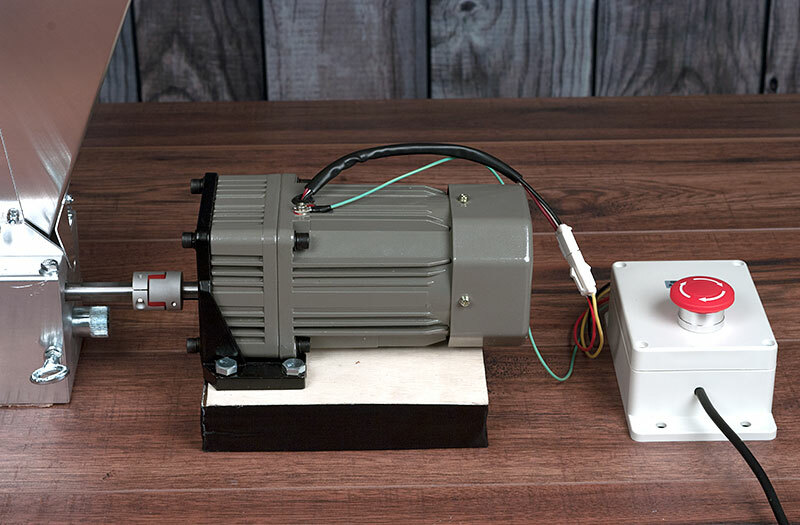 This high torque geared grain mill motor fits the 12mm shaft on our item B06 Three Roller Mill (and any other 2 or three roller mill with a 12mm drive shaft and 1½" diameter rollers), and features internal gears to spin your mill at 200 rpm. A heavy duty spider coupling absorbs the direct drive shock, and the 1 amp motor has plenty of power to turn. NOTE: This is for mills with 1½" diameter rollers only, it will not drive larger mills with 2" diameter rollers. 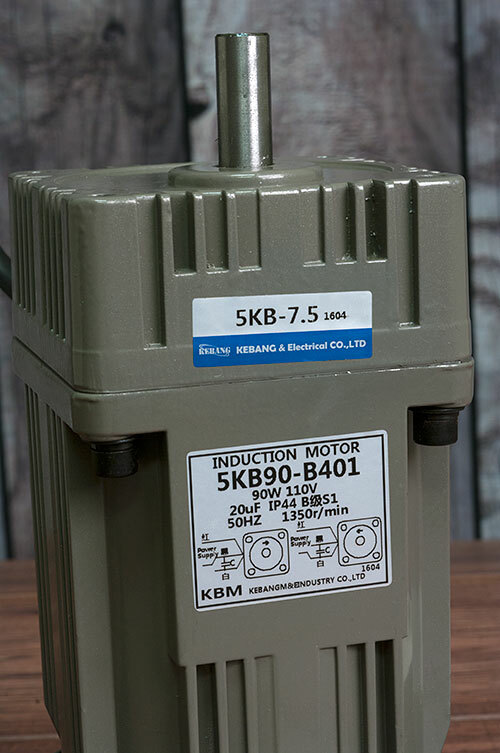 A safety switch is included for mounting on your mill mount. This includes a button that is harder to turn on than turn off (to turn on, twist the red knob and press down, to turn off, just press the red knob). 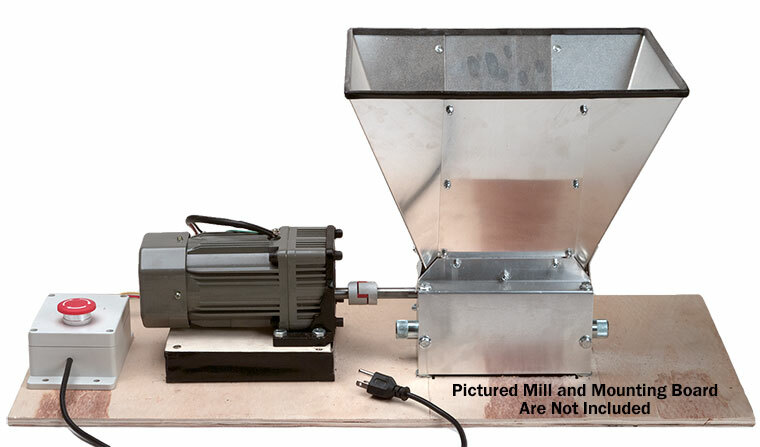 This kit requires wiring and installation, besides a Three Roller Mill, you will need to wire this mill to your 110 volt power source (a plug is not included). You will also need to build a table mount for this mill, and elevate the motor ½" so it will line up with the drive shaft on the Three Roller Mill. See the thumbnails for mounting and wiring ideas.. 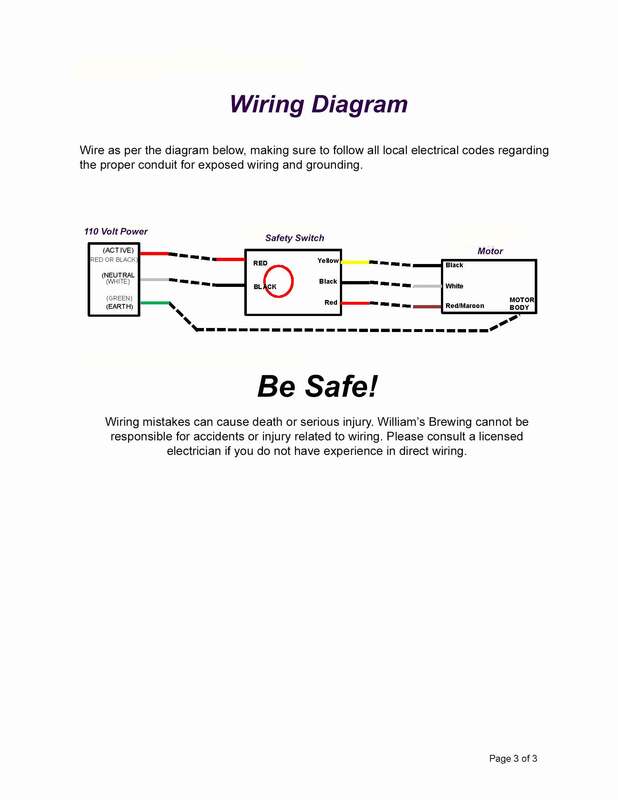 When wiring, besides the hot red and black neutral wires coming out of the safety switch that you wire to your house 110 volt hot and neutral lines, you will also need to wire a green ground wire from a mount on the motor to your three prong plug. For barley malt only, this mill does not crush corn. I'm old and I didn't like grinding my malt using a drill I had a hook up problem which Williams solved for me have only used it once but it works great. I also bought the triple roller grain mill with this. I built a small table with casters and mounted both on it. The wood that I used was just a bit over 1.25", so instead of shimming the motor mount, I just sanded the wood down to the perfect height. I used it the first time this weekend and it was obvious that I got a better crush than at my LHBS and it was all so easy to put together. The level of the motor is not level with the mill. I had to use a router to lower the base where the motor sits so that it aligned with the mill. The photo on the website are deceiving. That being said, the kit works like a charm and I'm very happy. This was a simple installation. Just had to take a few minutes to make sure everything would line up correctly. Easily turns our mill to properly crush our grain. Definitely makes milling 200lbs for a batch much easier then having to use a drill. good motor. slightly under powered for conditioned malt. shaft coupler set screws are poor connection as there is no keyway to prevent slippage. i drilled coupler and shafts and installed cotter pins. Couple of questions. 1. Do you have a recommended source for the power cord? 2. Will this fit the malt muncher without any additional couplers? We used an old computer power cord when wiring ours. This will fit the I13 Three Roller Malt Muncher without any additional couplers, although you will need to fabricate a base. What is the HP on this motor? Tell me this motor will work on a Monster Mill MM3 (three roller) with a shaft of 1/2 inch. Which will work if you cut down the spider coupler as shown on the web page for item B59.